Folk music has long formed part of the mainstream music scene in the UK with acts such as Jethro Tull, Nick Drake and Kirsty MacColl breaking into the charts over the years. More recently there has been an uptake in interest with the huge success of Mumford and Sons. Ken Nicol is a veteran of the UK Folk scene active since the 1970s playing along with such big names as Steel eye Span and members of Fairport Convention. Becky Mills first came to prominence as part of the band “Waking the Witch” whom she performed with in the early 2000s. Ken performs with an extraordinary talent; able to pick up a large variety of instruments from the ukulele to the electric guitar and make them sing. Becky sung with crystal clear poignancy that draws the listener in. Throughout the set the pair alternated between duets, solo singing and instrumental songs, this gave the evening nice contrasts in the pace and tone of the evening. One notable instrumental song ken performed was “Waltz with Alice” a beautiful tribute to Ken’s Mother. Many of the songs Ken performed including “The Song of Two Bridges” he had co-written with the legendary Ashley Hutching and it was obvious he was very proud of his time collaborating with him. Becky performed several songs from her first Solo Album “Dandelion” all of which come across with a sincerity and beauty that I can only recommend. When they sang together their different vocal styles complimented each other well and in between songs they kept the audience amused with a variety of stories and chat. Overall it was a very enjoyable evening and it was a shame that there was not more people to enjoy it. 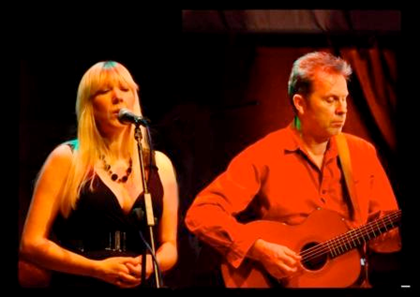 They are next performing on the 22nd October in the Hungry Horse Folk & Acoustic Club, Ellesmere Port and I would recommend any fan of heartfelt folk music to check them out.